So says Stephen Leeb in an recent interview with King World News which has been provided by Lorimer Wilson, editor of www.munKNEE.com (Your Key to Making Money!). This paragraph must be included in its entirety in any re-posting to avoid copyright infringement. Once gold gets going, people will be amazed at how fast the silver price moves. You are going to see three digit silver in the next couple of years. 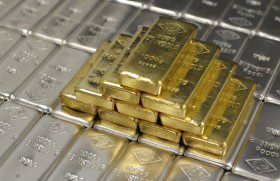 [Read: Stephen Leeb: Silver’s Going to $60, $70, by the End of 2012 – Easy!] Going forward, there simply isn’t enough silver available to satisfy both the industrial demand and investor demand. We will start to see strains in the physical market in silver at some point in the future. When that happens, silver will be off to the races. Great fortunes are made at super-bear market lows but you must have the money at the lows. [That is precisely] why gold is so singular and valuable. If you have gold at the bottom of the next bear market, you can exchange it for a collection of great common stocks or funds, and then sit back and relax. 4. New Analysis Suggests Gold Going to $3,495 in 2013, $6,233 in 2014 and Peaking at $31,672 in 2015! 5. Gold: $3,000? $5,000? $10,000? These 151 Analysts Think So! Silver will climb to $68-$70 in 2 to 3 months once resistance at $35 is taken out… In many ways silver is positioned today like it was back in the summer of 2010… Regarding gold, as goes oil, so goes gold…and the bottom line is that the wind is at the back of the bulls in both the gold and oil markets. 8. Alf Field Sees Silver Reaching $158.34 Based on His $4,500 Gold Projection! 11. Stephen Leeb: Silver’s Going to $60, $70, by the End of 2012 – Easy! 12. Goldrunner: Fractal Gold Analysis Says Gold On Way to $3,500 Mid-year! 13. Will Gold Peak at $2,500, $8,890 or $15,000? 15. Deja Vu? Is Gold Just in a Correcting Phase on Its Way to Parabolic Peak of $4,294? Previous The Time to Buy Gold Is When There Is Blood In the Streets and That Time Is NOW!